Editor’s note: Breastcancer.org is hosting a writing contest! Author and four-time breast cancer survivor Pamela Post-Ferrante is generously giving away three copies of her book Writing & Healing: A Mindful Guide for Cancer Survivors to three contest participants. No writing experience is necessary to enter. Pamela will review all submissions; winners will be announced in November. Simply complete the writing exercise below, and send your entry to writing@breastcancer.org by October 16, 2015. This kind of writing can be fun and therapeutic at the same time. When you write as if you were an object, you are not consciously writing about yourself. In this way, the imagination is free to write about a feeling or feelings not fully known to you. It is creative writing. It goes beneath the surface of your thinking mind: a spool of thread could just be a spool of thread, but sometimes it suggests mending, or getting tangled, or rolling away. It could mean that its majestic purple color is beautiful exactly as it is. 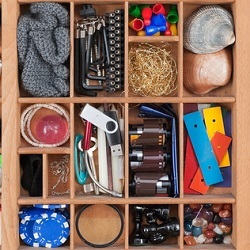 To begin, all you need is an object: Open a drawer. Without looking, pull out an object. The best drawers are the ones you throw everything into. Or, you could go for a walk outside and pick up the first object you see, or the second, or the third… Make it a game. Now, look at what you selected carefully for 3-5 minutes. Remember the senses… What does it look like? Think about what it might smell like, sound like, feel like, taste like (but don’t taste it). Make a list of all these things. Take 3-5 minutes to do this.Now write as if you are the object and you have a feeling. What story do you have to tell? You might begin, “I am Martha, a tube of lipstick” or “I am a pinecone who is…” Take 5-10 minutes to do this. Include a photo of the object with the story you finally write. Congratulations! You’re finished. Send your writing entry to writing@breastcancer.org, and I’ll review your work. We will announce the winning pieces in a future blog post. Enjoy your writing experience, and I look forward to reading your entries! Pamela Post-Ferrante is a cancer survivor, writer, teacher, and workshop leader. She taught in Lesley University’s Graduate School of Expressive Therapies from 2003–2011 and leads sessions privately and in Boston-area hospitals for cancer survivors. She has been published in several books, magazines, journals, and heard on NPR. She wrote Writing and Healing: A Mindful Guide for Cancer Survivors to help others. Learn more about Pamela, her book, and starting your own writing group at www.writingandhealing.com or on her Facebook page.